We promise stable garage doors, long-lasting and safe systems, and functional garage door parts. Our expert technicians have knowledge of all mechanisms in Texas and carry high tech equipment in their trucks for immediate and 24/7 garage door repair services. While buying yours, first of all remember to buy one that matches the weight and size of your door. In relation to its weight, a small garage door that protects a one car garage generally requires less than ½ horsepower to move, while a two-car door will require ½ horsepower and doors larger than that will need about ¾ horsepower. If you are in doubt, you can take advice from a garage door service on the best choice. A garage door is typically big and heavy, and is probably the biggest independent unit in a house. But it can be lifted up and pulled down by the feather-touch mechanism that a garage door opener incorporates. To ensure the smooth operation of this remote controlled opener, remember to choose the one that agrees correctly with your garage door and your personal needs. 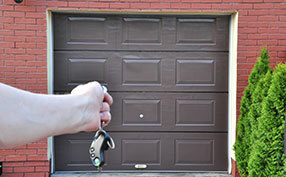 Garage Door Repair Company can guide you in your endeavor to choose a good opener. On an average, a garage door will be about 7 feet in height. And a normal garage door opener will be able to move a door of 7 ½ feet. When you are not sure of the horsepower requirement of your opener, to be on the safe side, opt to go in for one with slightly more horsepower than your door is likely to require, or you can consult a garage door company. A garage door opener can be a chain-drive, screw-drive, or belt-drive. Chain-drive is comparatively cheap, but it is noisy. If you don’t mind the noise, it is a good option. Some people mind the noise but others may prefer it because it is a way of informing those inside the home that a car has come in or that it is going out. Screw-drive ones are simple and easy to install, while belt-drive ones are absolutely silent and are also quite good. For more details on these three types, you can make enquiries to us at Garage Door Repair The Colony. From 1993, the United States government has made a safety provision mandatory in garage door openers. It is a mechanism that prevents the closing of the garage door if something passes underneath the door. As such, if an individual or a car or a dog happens to be below the door when it is coming down, the door will go back up without pushing down. Since this provision will rarely be used, it has to be tested periodically. If it is not working, you can contact a garage door contractor to get it corrected. The built-in lights of garage door openers normally last from 1 ½ minutes to 4 minutes. You can increase this time by adjusting its setting in the control panel of the opener inside the garage wall or can take the help of a garage door service provider to get it adjusted. For highly secured homes, the best option you have is installing an electric garage door opener. In Texas, we offer some of the best options for garage door repair services, as well as replacements and installation for your house at zip code 75056. 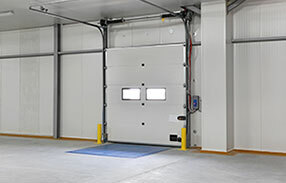 The overhead door parts prone to extensive wear and tear include the garage door extension and torsion springs, cables, rollers and hinges. Even though it is easy to overlook during the first stages of the construction of a house or an office, the garage door is very important, since it forms a large part of the façade.